Applying a Smart Warp to a Raster Image. All of the points can now be key framed. It's hard to believe I made it to the last nine tutorial videos for Moho Pro 12 but here we are. The final nine. 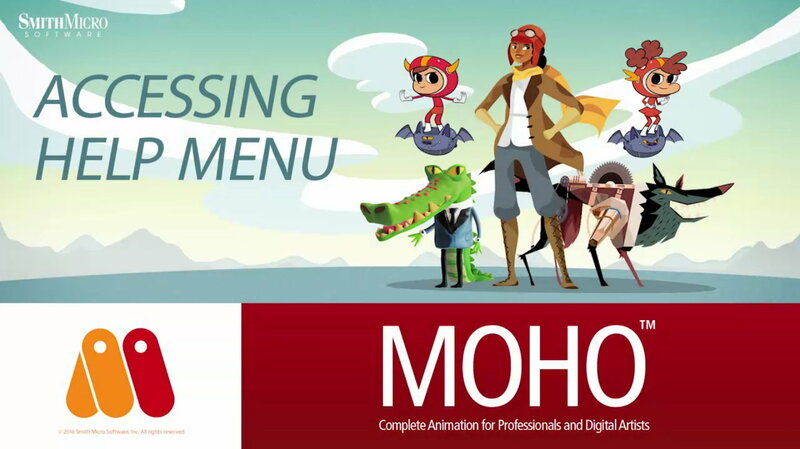 These videos focus on all the new features added to Moho Pro 12 that you won't find if you bought the cheaper Debut version. So, to find out what you're missing, or to see what you have (if you did or are buying the Pro version) read on. Read the previous post here. The first in the list, Pro New Features is pretty much just a run down of new features covered in more detail in the upcoming tutorial videos and includes some features already covered in the previous eight videos. You could skip it or watch it for a preview in the tutorial videos ahead. Work Space Creation is about setting up your preferred folder structure for new animations so that, whenever you start a new animation you can set up folders automatically and get animating sooner. You can have multiple work spaces, saved as templates, so you can choose which work space suits your latest project. It's a great way to stay organized and to keep content you use repeatedly across animations close to hand. to key frame Alvin's beak. The Switch Selection Window is a more user friendly tool for working with switch layers (such as those used for lip syncing animation). It gives you a visual image of the current switch layer and allows you to key frame from the window instead of in the layers palette. It's not an essential tool but it sure makes working with switch layers more visually fun. 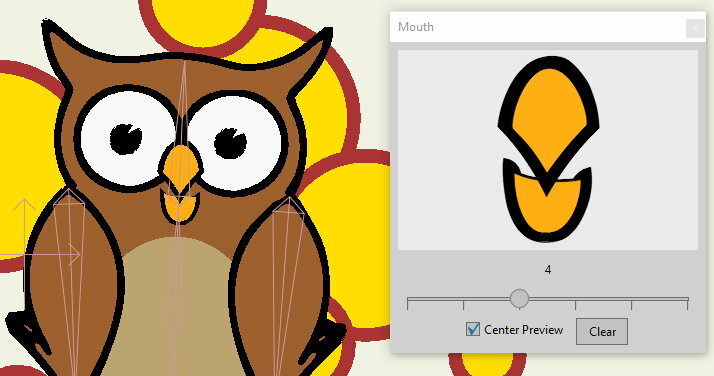 Bezier Handles are a standard in most Vector drawing applications but apparently this is the first time anyone's thought to include them in Moho. 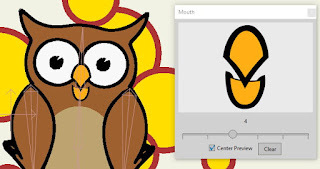 They work pretty much the same as they do in other vector applications to create and modify curved lines. 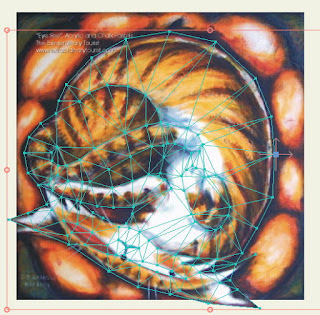 Though an added bonus seems to be that now freehand vector lines are now created with fewer points than they would have prior to Bezier Handles being implemented. 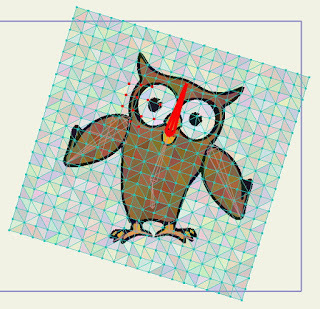 can add life to your raster images. Smart Warp - Image. This new feature is pretty much a way to animate almost any shape through the creation of a warp mesh. In the case of raster images (e.g. photos) creating the mesh will isolate just that area of the image the mesh covers and make the rest transparent. Once created you can key frame single points or groups of points and the mesh will determine how surrounding areas will be affected. Smart Warp - Vector. I had assumed this would work similarly to the Smart Warp Image version of the feature, and it does to some degree but is even more powerful. With Vector Smart warp you can create meshes that can warp entire character rigs either as they move or as they pass through certain areas of the screen. One use might be to apply exaggerated squash and stretch movement to your characters without directly distorting the character rigs themselves. The Import/Export Actions tutorial is a demonstration of how you can create and save actions (which has already been covered in an earlier video), and shows you how to transfer actions from one character to another. This can be done even if the characters don't have identical bone structures by converting actions to 'relative' imports. Realistic Motion Blur is a demonstration of some new settings for Motion Blur that creates a more realistic blur. Anything that moves in your animation can have a motion blur effect applied. It's pretty easy to add too, so worth exploring if you want to easily add a professional touch to your work. The Timeline Enhancements demo highlights two main new features. One is the ability to turn tracks (or channels in Moho speak) on and off so you can see just the ones you're actually working on. The other is the ability to mute tracks so that their key frames don't play out but remain intact. Useful, as shown in the demo, if you have a lot of camera movement that is making it difficult to key frame your characters as you scrub through the timeline. The final video, Moho Exporter, covers Moho's batch exporter which allows you to queue up several project files for rendering at once. Great for multi-scene projects or if you want to render one project in several different formats at the same time. This concludes my journey through Moho Pro 12's entire video training course. If you've made it this far, congratulations but let's never speak of this again! Well okay, maybe just a little bit more then. The purpose of all this was to sort through all the official videos and sort them into some kind of logical order of progression. I think that has been achieved. If you review all 12 parts of this blog series you'll get an exact order for the video along with a brief summary of what each contains. I think the summaries are particularly useful if you're looking to re-watch a specific video and aren't sure which one contains the information you're looking for. Update: If you've been following this series as I've been writing it you'll be pleased to know that I've now gone back through all twelve posts and, linked all the video titles to their corresponding video on the SmithMicro YouTube Channel. These videos were actually part of a bonus content offer when I purchased Moho from SmithMicro. The majority are re-badged tutorials from earlier releases of Anime Studio (mainly 10 and 11), therefore the online versions have different opening titles but the content is otherwise identical to the ones I bought. You'll also be pleased to know that I have compiled a complete list of links to all my blog posts in this series and all the video titles. The list will give you easy access to everything and will save you time searching through my posts looking for detail on specific tutorial videos.